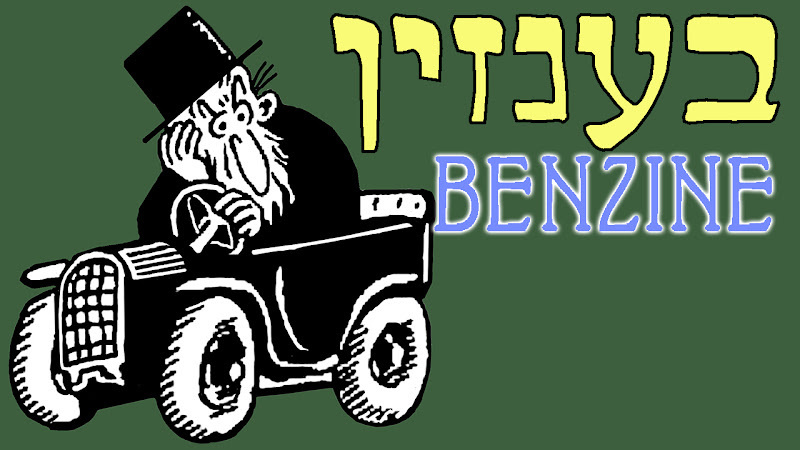 That's a picture of Gimpel Beynish the Matchmaker and one of his non-functioning cars. He's setting the scene for this prescient song about the role of gasoline (benzine) in our lives. A reader of this blog from South Africa, Eli Goldstein, wrote and asked if I had this song, and I didn't, but I said if he would get me the text I'd make him sheet music. So he got his friend Cedric Ginsberg to do it, and then I traded some work with Sheva Zucker and had her vet the transcription, so while I was going to all that trouble, why not record it? So I did. Even though Max Perlman's wonderful version is on YouTube. Max Perlman is a great singer, and it's so wonderful that a lot of his songs have been posted on youtube. He was born in 1909 in Riga, Latvia to a middle-class family. 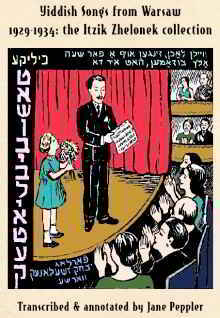 From the age of 6 he sang in a choir and then in Yiddish theater. He studied and performed in Riga, in Russian and in Yiddish. By the age of 20 he was performing in Kovno, Vienna, he toured Czechoslovakia, Poland, France, Belgium andEngland. In 1939 he was invited to Argentina, where he stayed for 3 years before moving onto Uruguay and Chile and, in 1945, to Latin America where he died in 1985. I don't know when he died. Transliteration and translation after the jump. I bought this sheet music on eBay a couple months ago but was too busy and too sick to sing it until now. Then, weirdly, Itzik Gottesman scooped me by a couple of days with this same very obscure number! Since he provides a lot of information, I'm sending you over there - check it out on his blog: Der dishvasher performed by Harris. He shares a recording made in his living room and also points you to a performance by Yablokoff himself. I have to laugh when I see how this dishwasher is dressed in a sort of toreador outfit, with a dashing gypsy kerchief and a cigarette. He doesn't look to me like he does many dishes. 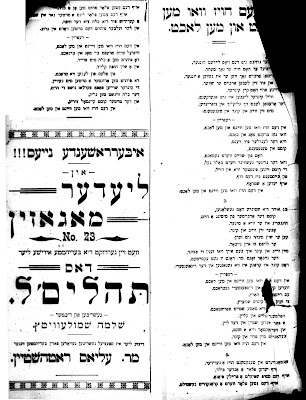 Vivi Lachs thinks the Bundist song Arum dem fayer was stolen from this song. Or perhaps vice versa. You may remember that Yablokoff is the author of Shvayg mayn harts which he insisted was plagiarized in the making of the far more famous jazz standard "Nature Boy." He did get a nice little pot of money in settlement. The sheet music has more lines per verse and more verses than the version Itzik Gottesman provided. Transliteration and translation from the Yiddish after the jump. In a hoyz vu men veynt un men lakht (In a house where one cries and laughs) - Yiddish song about a brothel. Previous update: Avery Gosfield recently gave me a new word for this kind of song, it's a contrafactum: "the substitution of one text for another without substantial change to the music." I've been calling them parodies, but parody to me implies humor or sarcasm, and in this case, neither is present. She also used 'canta si come' - so thanks, Avery! In the 1950s ethnomusicologist and Yiddish enthusiast Ruth Rubin recorded many 10" tape reels of Yiddish songs, some now vanishingly obscure. One of the "lost" songs from the Itzik Zielonek collection was in the Rubin collection; it was sung by a Mrs. Dillman in the 1950s in Montreal. The tapes reside at the New York Public Library but it was Lorin Sklamberg at YIVO who kindly sent me the a capella verse-and-a-half on this reel. Itzik has it as "In a hoyz vu men veynt un men lakht" but the Ruth Rubin recording has: "In dem hoyz..." The title means: "In a house where there's tears and laughter" (or "In the house where people cry and laugh"). There was supposedly a recording in 1912 by L. Braun on a Syrena Grand Record, In der haus wu men weint un men lacht, but I've never heard it. 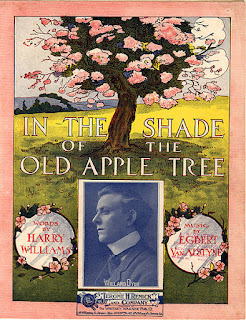 I recognized the tune but couldn't remember the name, so I turned to one of those "name this tune" internet services and turns out it's from a 1905 song by Egbert Van Alstyne (original words: Harry H. Williams) called "In the Shade of the Old Apple Tree." I wonder if perhaps this Yiddish song became so thoroughly lost because this tune is so completely un-Jewish and its sweet, sentimental affect is so bizarre paired with these dark lyrics. Being so Gilded Age and goyish, the song is not typical of the Zhelonek collection. Aviva Enoch and I recorded it in March 2013 and Randy Kloko added baritone on the chorus. The version printed by Zhelonek is about a whorehouse. I wonder which came first? Here are his lyrics, which do not scan very well. I was especially pained by the word tsuzamen (together) which should have the accent on the second syllable but which fits in this chorus only with the accent on the last syllable. And here I suffer from hunger and pain." "No, young man, you'll be with me today." Where did you come from, to end up here?" I was forced, a poor thing, to come here." The version Mrs. Dillman sang has a few English words in it and is more literally about a (tenement) house in which there are happy people and sad people. Where the greenhorn quickly becomes ? This song - spelled Die Roumanishe kretchme and Die Rumainishe kretchme on the sheet music - and performed as Roumanishe Kretchme by klezmer hiphop performer SoCalled (Josh Dolgin) - is from a show called Helo Mali (Hello, Molly), starring Molly Picon, staged at the 2nd Ave Theatre as early as 1926 (accounts differ). It was directed by Jacob Kalich, with music by Joseph Rumshinsky and lyrics by Morris Rund. 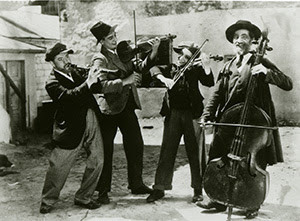 In 1932 Picon took the show to Argentina under the name Der kleyner mazik (The Little Devil). The show was written by Sheyne-Rokhl Simkof, Semkoff) (Sheyne Rochl Simkoff). 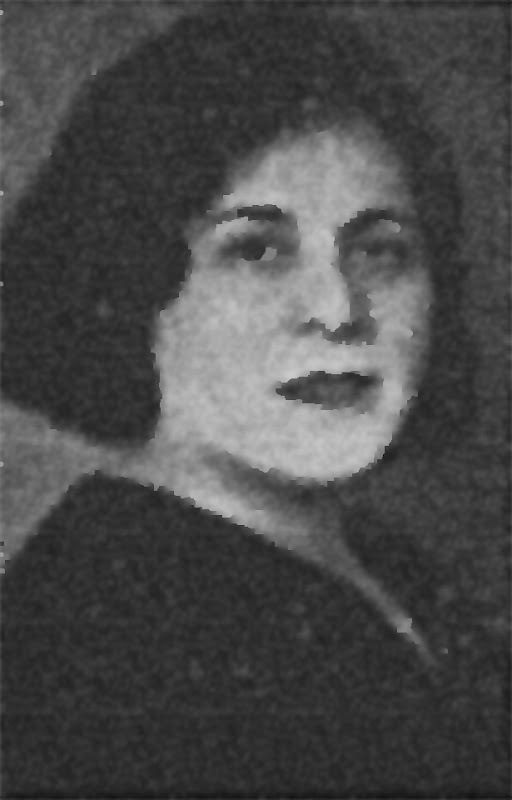 Shaye Rachel Simkoff was born in 1899 in Grodno. In 1915 she came to America and worked in a sweatshop, writing stories, plays and poetry by night. She eventually became successful enough to quit the sweatshop and make her living writing. The excellent recording I have is by Irving Grossman, probably from 1929. 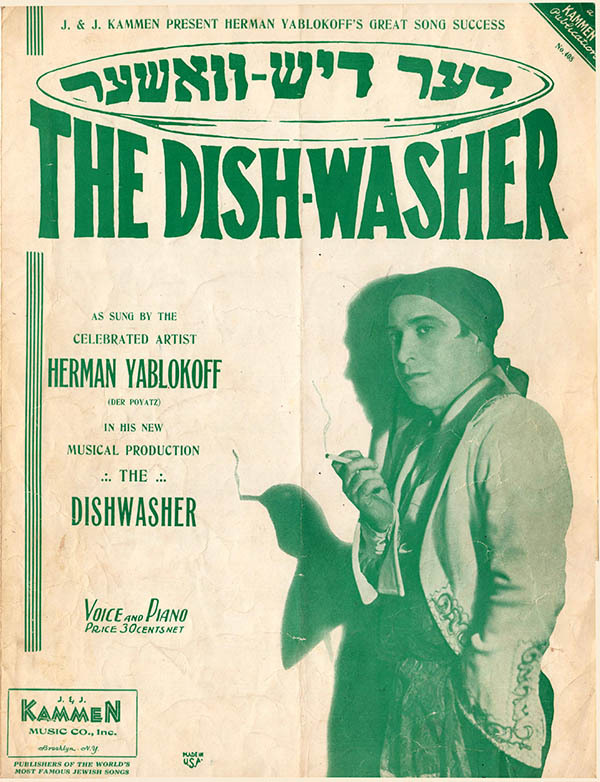 Today I got yet another request for this song, one of the most popular songs in the Yiddish theater song repertoire. Oy, mame, bin ikh farlibt was written by Abe Ellstein for Joseph Green’s 1936 film Yidl mitn fidl. Joseph Green's films are priceless because they were shot in Poland just before the holocaust. A lot of the crowd scenes were shot with locals and passers-by. My band Mappamundi recorded this in 1994, before I had ever decided to study Yiddish. Bassist Robbie Link plays the solo. Skylark2.com (Skylark Productions) sells cabaret, British Isles, World music cds and songbooks. It's a cottage industry! After three years of research I have managed to find melodies for 106 of the 126 song lyrics found in record store owner Itzik Zhelonek's seven books of "Famous theater songs" - there are about 20 to go, perhaps they'll never be found.